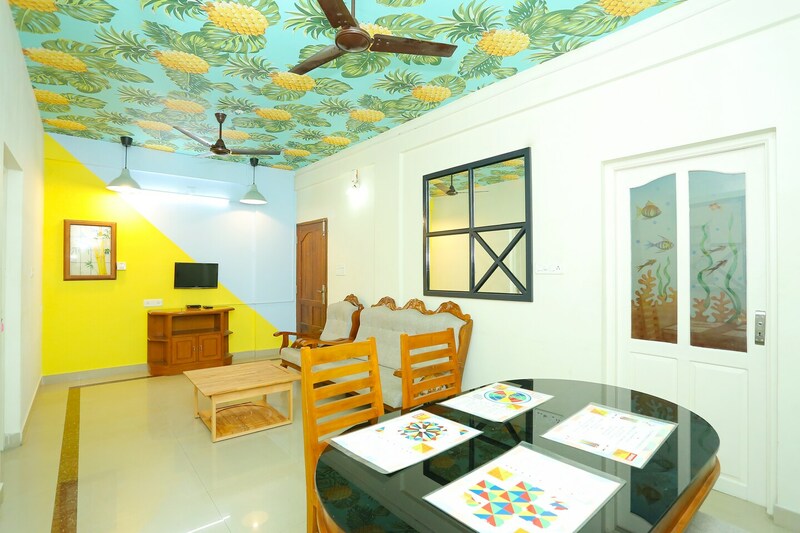 Home Graceful Elamakkara is modern, stylish and elegant residence, made for guests looking for the perfect getaway in Gods own country.Inspired by the coastal surrounding of Kochi, the rooms in this residence is bright, warm and delightful with living area having a two-tone wall painting and the ceiling is decorated with pineapples which is quirky and gives a spunky vibe to this place. The rooms are bright and well lit, mainly due to the windows for light and coastal breeze. Modern and wooden furnishings make the rooms pleasant and cozy.The kitchen is modern and elegant with basic amenities and utilities provided for a hassle free stay. Various other facilities include parking, power backup and CCTV cameras for security of guests.